Hi folks, Doc here. 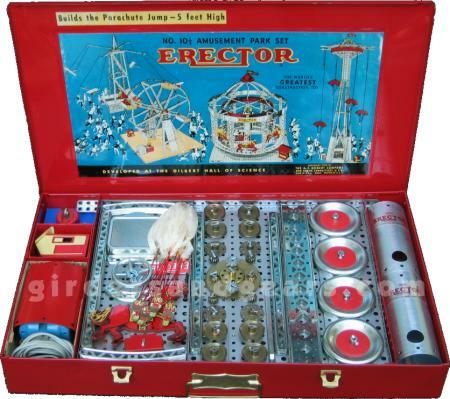 Well, this is it - the Erector set I wanted as a boy, and the first one I bought for myself as an adult: A.C. Gilbert's famous Amusement Part set. 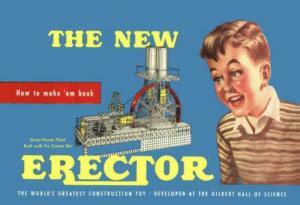 During the Renaissance Period of Gilbert Erector, there was one set that was larger, but none was more popular. For many of us, the early '50s version of the 10½ was the perfect set, perhaps the best ever. The set comes in the now iconic red painted steel box with brass latches and carrying handle. It features the familiar yellow "kneeling boy" label on the outside of the box lid. Inside the lid is one of the most colorful and attractive labels of the period, on which are displayed the Carousel, Airplane Ride, Ferris Wheel, and Parachute Jump models. A second much smaller label glued above the main label states that this set "Builds the Parachute Jump - 5 feet High". While the aforementioned brass latches and handle are attractive additions to the box, they are no match for the size and weight of this impressive set. The 10½ is large and quite heavy: the box measures 22¼" long x 13" wide x 3" deep, and fully packed weights in at just over 25 pounds. 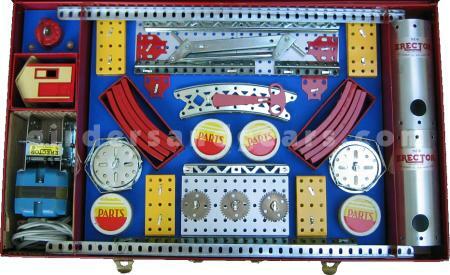 Inside, parts are arranged in what had by this time become Gilbert's standard packaging format for metal-boxed sets. The A49 electric motor, 2 T boilers, MX house, electromagnet, and two light bulbs were stored in compartments on either end of the long box. These compartments are separated from the central section of the box by solid steel partitions. This central section held most of the parts, which were arranged in three layers. The top layer was composed of three trays, each made from two MN 12" base plates (see photo above). The ends of these trays, which held a variety of girders, wheels, gears, along with the parachutes, carousel horses, and other parts, rested on two MB 18½" angle girders which fit into slots in the box partitions. Beneath the trays was the second layer of parts, which included P79 car trucks, BN turret plates, and MC, MD and MY base plates, among others. The parts were attached to a raised, dark blue cardboard insert panel with metal t-clips (see photo below). Six openings were cut into the insert to accommodate four part cans and two cardboard boxes, each of which held four CS wheel segments. Finally, the remainder of the parts, including ME and MF base plates, girders, strips, and axles, were stored beneath the insert. But, as impressive and well designed as this set is, its popularity is based largely on a few special models that it was created to build, namely the Carousel and Parachute Jump. Along with the earlier Airplane Ride and Ferris Wheel models, plus other wonderful creations like the Giant Power Plant, these models have become famous in their own right, and favorites among builders for many years (myself included). And, they have each inspired builders to create variations on their designs. All of these models, both original and updated versions, are on display in my Model Gallery.